Reflections on the growing interest in narrow gauge over the last sixty years, and before. Article Seventy five years plus! 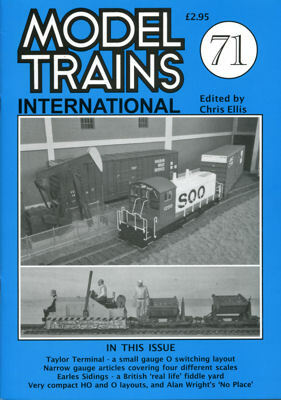 Looking back over early days in the hobby and adventures with amongst other things 1970's BR, N, Eggerbahn, Minitrix and many other comments, Part 2. Ventures in American HO with a very small layout. A common modern American rail-served facility that is easy to model. Suggestions for narrow gauge locos and stock in 1n20 or 1n22. A quarry module on a pizza box-a competition entry for layouts 12in square. Layout description . . . . . and the smallest Inglenook! Another competition entry with a German theme 12in square. An American freight terminal for O gauge but with a HO version shown. Another look at the potential for coversion of Dapol/Airfix bungalow kits to UK flats, American gas stations, yard offices, stores, huts and many other items. A UK theme based canal basin layout in On16. 5 narow gauge, using Jack Trollope's Box Street Yard design. A small shunting layout with hand laid O track using a three way point and one other. A present day real life fiddle yard in Derbyshire UK. A look at one of Alan Wright's other clssic layouts in HO/OO of a small branch terminal.